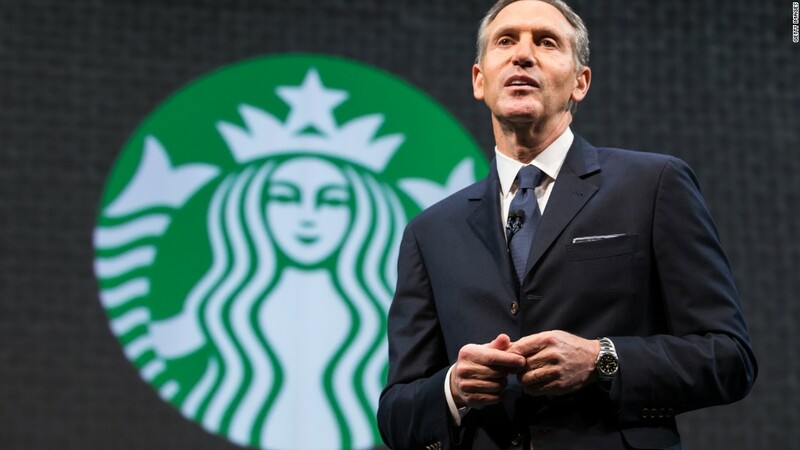 Starbucks CEO Howard Schultz is the embodiment of the American Dream. But in a speech to shareholders in late March, the billionaire CEO said he fears the opportunities that allowed him to achieve his American Dream have fallen out of the grasp of too many people. I've struggled for weeks to find the right words to express the pain I feel about where America is headed and the cloud hanging over the American people. There are moments when I've had a hard time recognizing who we are and who we are becoming. We are facing a test, not only of our character, but of our morality as a people. It's a crucible of our lives and those of our children. The still photos in the video we shared are profoundly sad, and yet, when we hear the heartfelt words of Robert Kennedy, we're all comforted. In 1968, on the night of the assassination of Martin Luther King Jr., he stood on the back of a flatbed truck in Indianapolis with no notes and comforted an entire nation. We all long for that kind of leadership and those heartfelt words more than any other time in our collective lives. Related: Starbucks CEO says voters are embracing "fool's gold"
In 1960, as a young boy, my mom took me by the hand, and we walked what seemed like miles to a rally. A presidential candidate was making a rare campaign appearance in the Brooklyn that I lived in. When we got to the rally, there must have been thousands of people there. As a young boy, I could not see over their heads, but I heard the voice and the words of John F. Kennedy. As he spoke, I could feel the grip of my mother's hands tighten around mine. As I stood and looked up to her, I can still see the glow on her face. She felt as if he was speaking to her. His vision for America's future was optimistic, even for those of us whose station in life was to live in public housing and hold blue-collar jobs. She believed her family's future and her children's future were linked to that American dream because of the faith and confidence she had in the leadership that he presented. And I stand here before you as living proof of that American dream. Two years ago at this very meeting, I spoke about the problems in America and the lack of leadership that we all were witnessing, and I framed the important question: What is the role and responsibility of a for-profit company during these times? Related: Starbucks CEO to employees: Go vote! Unfortunately, in the two years that have followed, the dysfunction and the polarization has worsened. Broken promises, void of truth and leadership have led to a fracturing of trust and confidence, not only in our elected officials, but in our institutions. I've always viewed the American dream as a reservoir, and it has constantly been replenished with values, work ethic, and the spirit of the American people. But, sadly, our reservoir is running dry, depleted by cynicism, despair, division, exclusion, fear, and, yes, indifference -- and, in my view, all wrapped up in fool's gold. Given what's at stake, I humbly today pose a different question. And that is, what is the role and responsibility of all of us as citizens? We must do everything we can to reclaim and reimagine the American dream and fill the reservoir back up, not with cynicism, but with optimism. Not with despair, but with possibility. Not with division, but with unity. Not with exclusion, but with inclusion. Not with fear, but with compassion. Not with indifference, but with love. It's not about the choice we make every four years. It's about the choices we are making every day. I've shared this story with some of you before, but I believe it's worth repeating. It's my sage rabbi and the lesson he taught me about humanity. It's what happened during the Holocaust. As we all know, men and women and children were transported in the worst possible conditions by rail car. That journey took two or three days at times. People were sandwiched in like sardines. That journey -- two, three days, no air, no water, no bathroom. When they arrived at the camps in the cold, cold winter months, men were separated from women, women from children. And one person for every six was given a blanket, and that person who received the blanket had to decide, am I going to keep this blanket for myself, or am I going to share it with others? And the lesson in humanity was that most people did share it with others. Given what's going on in the world, as I stand here before you, I ask you today to share your blanket with others, regardless of the color of their skin, regardless of their religion, regardless of their gender, regardless of their sexual orientation, regardless of their station in life or their politics. Let's fill our reservoir back up with the true promise of our country and, once again, embrace what it means to be Americans. Thank you very much.